The Church of God has gone into the entertainment business! People must be amused, and as the church needs the people's money, the church must supply the demand and meet the craving! How else are godless hypocrites to be held together? So the picture show and entertainment . . . take the place of the gospel address and the solemn worship of God. And, thus, Christless souls are lulled to sleep and made to feel "religious" while gratifying every carnal desire under the sanction of the sham called the church! And the end? What an awakening [in eternity]!
. . . We visited Willow Creek Community Church not too long ago, and it seems to have spared no expense in its missions to attract the masses. Looking past the swans gliding across the mirror lake, one sees what could be mistaken for a corporate headquarters or a very upscale shopping mall. Just off the sanctuary is a large bookstore and an extensive eating area supplied by a food court with five different vendors. A jumbo-tron screen allows an overflow crowd or those enjoying a meal to view the proceedings in the main sanctuary. The sanctuary itself is spacious and high tech, complete with three large screens and state-of-the-art sound and lighting systems for multimedia, drama, and musical presentations. . . .
Mega-churches across the country have added bowling alleys, NBA regulation basketball courts with bleachers, exercise gyms and spas, locker rooms, auditoriums for concerts and dramatic productions, and Starbucks and McDonald's franchises -- all for the furtherance of the gospel. Or so it is claimed. Although it is true that such churches are packing them in, that's not the whole story in evaluating the success of this latest trend in "doing church.". . .
Evangelical church-growth leaders are adamant that the marketing approach can be applied -- and they have employed it -- without compromising the gospel. Really? First of all, the gospel and, more significantly, the person of Jesus Christ do not fit into any marketing strategy. They are not "products" to be "sold." They cannot be refashioned or image-adjusted to appeal to the felt needs of our consumer-happy culture. Any attempt to do so compromises to some degree the truth of who Christ is and what He has done for us. For example, if the lost are considered consumers and a basic marketing "commandment" says that the customer must reign supreme, then whatever may be offensive to the lost must be discarded, revamped, or downplayed. . . .
Secondly, if you want to attract the lost on the basis of what might interest them, for the most part you will be appealing to and accommodating their flesh. Wittingly or unwittingly, that seems to be the standard operating procedure of seeker-friendly churches. They mimic what's popular in our culture: top-forty and performance-style music, theatrical productions, stimulating multi-media presentations, and thirty-minutes-or-less positive messages. The latter, more often than not, are topical, therapeutic, and centered in self-fulfillment -- how the Lord can meet one's needs and help solve one's problems. . . .
Thousands of churches here and abroad have completely restructured themselves as outreach centers, for the unchurched. This, by the way, is not biblical. The church is for the maturing and equipping of the saints, who then go out to reach the lost. . . . The vast majority of those who attend seeker-friendly fellowships profess to be believers. Yet most were drawn to those churches by the same worldly allurements that were meant to entice the unchurched, and they continue to attend, being fed the same biblically anemic diet created for the wooing of unbelievers. At best, they receive the skimmed milk of the Word; at worst, pablum contaminated with "profane and vain babblings, and oppositions of science falsely so called" (1 Tim.6:20). . . . The overriding message from psychologically driven Willow Creek and Saddleback is that the Word of God and the power of the Holy Spirit are insufficient for delivering a person from a habitual sin and for transforming his or her life into one that is fruitful and pleasing to God. . . .
Well, it’s been almost a week since my last post. We were 500 miles away from home due to the death of my father-in-law. Getting caught up now is going to take me a while! I figured I may as well start out with a “Random” post based on links I’ve collect the past couple weeks. Oh joy! Roma Downey has a new TV show. Downey, a New Ager/Roman Catholic, will be highlighting false teachers — as standards of truth!!!! Erin Benziger gives a perfect example as to why I rarely step into a “Christian” bookstore. They are minefields of aberrant theology, apostasy, heresy, and even outright blasphemy — let alone idol worship! Freemasons have claimed that Jesus was married and had children, the Mormons have claimed that Jesus was married and had children, the “Da Vinci Code” made similar claims. And if that wasn’t enough people lying, you can buy a new book with the same story! And of course they all say the the wife was Mary Magdalene. Someone really needs to get a new lie. While this article may be a bit humorous, there is much truth in it. The way so many in our culture see Jesus has no resemblance to the Jesus of the Bible. Many people claim to have come to Christ due to Billy Graham and his crusades. However, as I have previously pointed out, Billy Graham is not really a good teacher! He may be used by God to reach people, because God can use many things to reach people, but he still has some really rotten teachings and theology. After all, many of those attending his crusades are sent to Roman Catholic churches for further spiritual guidance, and he teaches a form of universalism. Additionally, Graham has very often sanctioned false teachers, and his political affiliation is the Democratic party! I could give a whole lot more reasons why Billy Graham should not be followed or recommended, but I’ll leave that to this article by Elizabeth Prata. Sola Sisters has a great article about Reconstructionism (and Dominionism), of which I have many times stated is a legalistic and aberrant theological system. Neil has a good examination of one of the prayers to “Mary” used by the Pope. As Neil notes, this prayer gives Mary the attributes of the Holy Spirit. If you want to know who to watch out for in regards to bringing the “new spirituality” into the church (stuff like lectio divina, labyrinths, contemplative prayer, Spiritual formation, etc), Lighthouse Trails Research Ministry has a listing of them. Lastly, Lighthouse Trails also has a report about the damage control at Thomas Nelson in regards to Sarah Young’s book, “Jesus Calling.” Thomas Nelson apparently only cares about false teachings when an uproar is made, since they still publish Benny Hinn. If truth be not diffused, error will be; if God and His Word are not known and received, the devil and his works will gain the ascendancy; it the evangelical volume does not reach every hamlet, the pages of a corrupt and licentious literature will; if the power of the Gospel is not felt throughout the length and breadth of the land, anarchy and misrule, degradation and misery, corruption and darkness, will reign without mitigation or end. The man whose doctrine is shaky will be shaky in his whole life. . . those who are driven with every wind of doctrine are those who are too lazy to study doctrine. My observation over the years is that the people who have not been taught the truth negatively as well as positively always get carried away by the heresies and cults. . . .
D. Martyn Lloyd-Jones, quoted in The Banner of Truth magazine, Aug/Sep 1986. Cited in "Quotable," The Berean Call, June 2001. Today I played for a funeral at a Catholic church 76 miles away. I play for many funerals and weddings at Catholic churches because they have many Irish-descent families, and they like the bagpipes. Catholic funerals are always so sad for me, because the liturgy and rituals, including the Mass, only demonstrate how lost they are in their traditions, and how burdened these people are with all the works they feel are necessary for salvation. In fact, the priest said of the deceased that he was afraid of dying because he didn't think he was good enough to go to heaven! What a burden!!! Today, while waiting around, I picked up two items from a display - sort of like a tract rack. They are such good examples of what is wrong with the doctrine of the RCC that I decided I had to write about them! This picture is the front side of the first one. 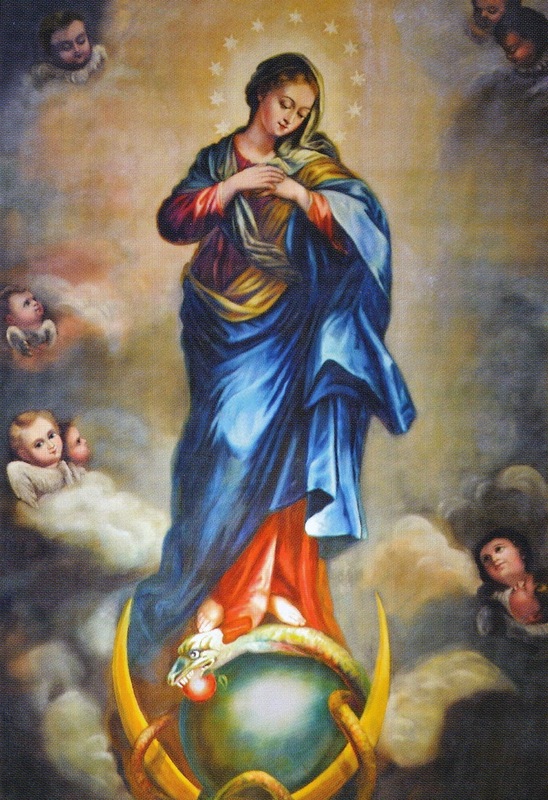 It is posted by the "Knights of Columbus," and the image is titled, "Immaculate Conception," by Sister Marie de i'Eucharistie. "We fly to thy protection, O holy Mother of God; despise not our petitions in our necessities, but deliver us always from all dangers, O glorious and blessed Virgin. Amen." The next painting is a scene from the book of Tobias in the Apocrypha. 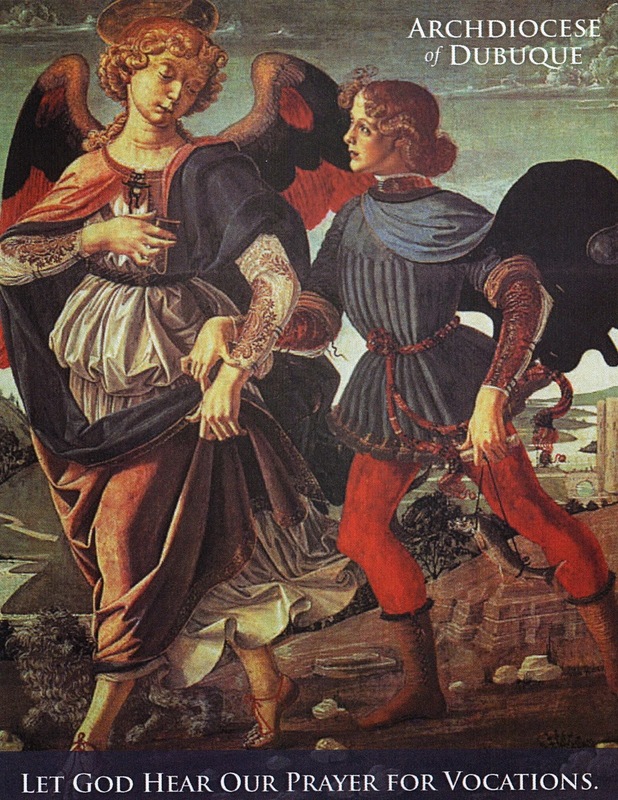 It is called, "Raphael and Tobias," by Andrea del Verrocchio (1435-1488). The prayer on the back of this is called "Prayer for Vocations," and is quite lengthy. And for more information you can contact the Director of Vocations in Dubuque, IA! "Saint Raphael, Angel Guardian of our Archdiocese of Dubuque, who stands before the Divine Majesty, and is sent by God to bring healing to those who suffer and help those who journey, hear our prayer. "As you were an Angel Guide to Tobias, attend now to people still on the way towards discovering, embracing, and living God's plan, whether to be: a priest or deacon in the Archdiocese of Dubuque; a religious sister, brother or father; a wife or husband; or a dedicated single person. "And then, once having arrived at that destination, be our constant companion as we do our part to carry on the Church's mission, as we imitate Jesus' gift of self in service of others, and as we make our pilgrim way through this life to our true home in heaven. "St. Raphael the Archangel, pray with us that we will all hear, answer, and live our vocation, for the glory of God and the benefit of others. And pray too that we will always have priests to heal and help us in the future. "Conscious of our need and confident of God's help, we say, Amen! May it be so!" 1. How do they know that "Raphael" is their guardian angel? Did someone in the Dubuque Archdiocese have a vision from God to tell them? Did "Raphael" visit them? 2. How do they know that "Raphael" is sent to help "those who journey"? 3. Why are they praying to an angel?!?! Is there anywhere in the Bible in which people pray to angels? Are we ever instructed to pray to angels? 4. If we can pray directly to God through our mediator, Jesus Christ, what is the purpose of praying to an angel? 5. If every Catholic prayed to "Raphael," wouldn't that mean that, like Mary, he'd have to have the attributes of God? It is truly sad that Roman Catholics have been so deceived to the point where they have no idea that they have no need of saints or Mary, because they have ONE mediator between them and God (1 Tim. 2:5), and our prayer are to be to the Father in Jesus' name. Unless you’ve been in a coma, it is difficult to miss the news about the “prayer service” last Friday at the Washington National Cathedral. This was a MUSLIM prayer service in an ostensibly Christian facility. Can’t you just see Paul inviting the pagans to pray to their gods while assembling with Christians? Perhaps Elijah was wrong to challenge the Baal worshipers? Even the secular press had an excellent commentary about this event, addressing an issue the Episcopals are obviously totally ignorant of, let alone the issue of theology. Only one person spoke the truth during this service; a woman who drove from Tennessee just to expose the fraud for what it was. The sad thing is that there were no men with the courage to stand up to this as she did. How many hundreds of thousands of good Christian men within short driving distances would have been able to do the same thing? The defense of the Christian faith is more and more done by women, as men abdicate spiritual leadership. With all the protest marches in front of abortion clinics, at “gay pride” parades, etc, where were these protesters when Muslims are invited to a “Christian” facility to promote the religion of Islam? If the woman could make a point by disrupting the service, couldn’t a point also have been made by a solitary man outside with a sign? I’m just making a point, but in reality I doubt if this woman accomplished much. After all, those in charge of that church long ago turned apostate and will not listen to rebuke. 11/27/14 UPDATE: Excellent commentary by Eriwn Lutzer. It is astonishing how many have come to equate "worship" with loud and fast-paced music where the tragic poverty of the lyrics isn't even noticed because the rhythm excites the soul. Such music is essential, we are told, to attract the new generation. Will they rise to the low level of our estimation of them? And our church has, unfortunately, accepted this philosophy. Early in his career, a young friend advised him [Savonarola] that his manner of preaching did not compare favorably to that of a great (and now forgotten) orator of his day. "To which Savonarola made reply, almost in anger, 'These verbal elegancies and ornaments will have to give way to sound doctrine simply preached.'" Savonarola did not aim to impress the people with his preaching, but with the truth. In fact, his early attempts at preaching were flat and nondescript, but in time, by means of "sound doctrine simply preached," that delivery became so eloquent it both stung and stunned the world. Here I am still busier than a one-armed wall-paper hanger, and still hoping to have time to continue my review of the book, New Age Bible Versions. And I’m working as quickly as possible to get all my articles about Mormonism transferred over to my new “Anti-Mormon Blog,” while also adding “Random….” posts over there! I am still trying to keep up with the latest news about false teachings and false teachers so as to warn my readers about these things with these “Random” posts. Meanwhile, I hope the quotes I have been posting here have been thought-provoking or edifying. I don’t visit “Christian” book stores much, because walking through them gets me riled up to see all the false and heretical teachings being sold as “Christian,” so I apparently missed that Joel Osteen, in collaboration with his wife Victoria, have their own Bible being published. “Hope For Today Bible” features “Notes and Encouragement from Joel & Victoria Osteen.” Just what we need — a Bible polluted with the Osteens’ poison. I’ve previously reported on the new “Holy Ghost” movie and how unbiblical it is (of course). I came across a YouTube video this week, which I recommend for your viewing, which has an excellent review of the movie. It is 1 hr 36 minutes in length, but it would be well worth your while. I was able to watch/listen to this review by keeping it in one corner of my desktop screen while I worked on other projects — that might be a good way for you to spend the time. If you’ve never heard of Dr. Scott McQuate, be forewarned that he is a false teacher. Earlier this year The Berean Call exposed some of his teachings, and a reader took issue with them. The latest issue of TBC has a thorough response to the reader, with a good examination of McQuate’s teachings. Beth Moore seems to never be out of the spotlight with her false teachings. Her teaming up with Joyce Meyer is just one of the things which prove she doesn’t hear from God as she claims! Erin Benziger has a bit more examining of Moore’s teachings. Lighthouse Trails Research Ministry has a new booklet tract available: “Changing ‘Jesus Calling’ — Damage Control for a False Christ.” You can read it in its entirety on-line. Can anyone show me from Scripture where Christians are to have exorcism ministries? OF course with the Pope blessing them, that’s just another example of the false teachings of Rome. Rick Warren and Russell Moore are teaming with the Pope for an “interfaith conference.” Can’t you just imaging Paul telling the Church to have “interfaith conferences” with the pagans of his day? Mark Driscoll - again. That guy just needs to grow up, have a serious repentance, and give up all ministry ideas. As he plays the victim, he is a disgrace to the body of Christ. The same subtle pressures today would persuade preachers to get in step with the times and ride the wave of the future. What we need are more preachers out of step with the times, more odd prophets like Micaiah…. The pulpit is not a platform from which to boost the projects of men to bring in a false millennium…. It is better to be divided by truth than to be united in error. It is better to speak the truth that hurts and then heals, than falsehood that comforts and then kills. Let me tell you something friend, it is not love and it is not friendship if we fail to declare the whole counsel of God. It is better to be hated for telling the truth, than to be loved for telling a lie. It is impossible to find anyone in the Bible who was a power for God who did not have enemies and was not hated. It's better to stand alone with the truth, than to be wrong with a multitude. It is better to ultimately succeed with the truth than to temporarily succeed with a lie. 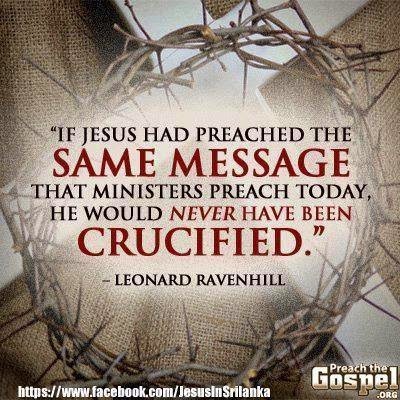 There is only one Gospel and Paul said, "If any man preach any other gospel unto you than that which we have preached unto you, let him be accursed." Objection is often raised even by some sound in the faith - regarding the exposure of error as being entirely negative and of no real edification. Of late, the hue and cry has been against any and all negative teaching. But the brethren who assume this attitude forget that a large part of the New Testament, both of the teaching of our blessed Lord Himself and the writings of the apostles, is made up of this very character of ministry-namely, showing the Satanic origin and, therefore, the unsettling results of the propagation of erroneous systems which Peter, in his second epistle, so definitely refers to as "damnable heresies." Our Lord prophesied, "Many false prophets shall rise, and shall deceive many." Within our own day, how many false prophets have risen; and oh, how many are the deceived! Paul predicted, "I know this, that after my departing shall grievous wolves enter in among you, not sparing the flock. Also of your own selves shall men arise, speaking perverse things, to draw away disciples after them. Therefore watch." My own observation is that these "grievous wolves," alone and in packs, are not sparing even the most favored flocks. Undershepherds in these "perilous times" will do well to note the apostle's warning: "Take heed therefore unto yourselves, and to all the flock, over the which the Holy Ghost hath made you overseers." It is as important in these days as in Paul's - in fact, it is increasingly important - to expose the many types of false teaching that, on every hand, abound more and more. Many Christians have the misconception that to win the world to Christ we must first ... make unconverted sinners feel comfortable with the Christian message. ... Give them something they want. Put on a show. Entertain them. Avoid sensitive subjects like sin and damnation. .... The strategy is to tantalize non-Christians rather than confront their unbelief. That is altogether incompatible with sound doctrine. It is compromise with the world. James called it spiritual adultery. John MacArthur, "Reckless Faith: When the Church Loses Its Will to Discern." Consider the March for Jesus, which brings literally millions around the world into the streets to “celebrate Jesus.” This massive display of loyalty to Christ is intended to show the world that Christians are a large and powerful segment of society that can’t be suppressed but must be given their rights as much as demonstrating homosexuals. Marches let the politicians know that here is a large voting block [sic] to be appeased. In The Star of 2000, Jay Gary boasts that “the March for Jesus is becoming the world’s biggest street party.” Is that really why Christ came, so that street parties could be held in His name? March For Jesus literature encourages everyone including Catholics and even Hindus, Buddhists and Muslims to join Christians in the Jesus celebration. How can those who embrace religions and philosophies that oppose Christ express appreciation for Him? Does this not produce pseudofollowers of Christ, as far from the truth as those in John 2, 6 and 8 and as much opposed to the gospel? Gandhi admired Jesus but remained a Hindu whose very admiration for his false “Christ” prevented him from knowing the real Jesus and why He came. The “March for Jesus” is a total waste of time for Christians. It accomplishes absolutely nothing in the way of preaching the gospel or leading people to Christ. Truth demands confrontation: loving confrontation, but confrontation nevertheless. If our reflect action is always accommodation regardless of the centrality of the truth involved, there is something wrong. Just as what we may call holiness without love is not God’s kind of holiness, so also what we may call love without holiness, is not God’s kind of love. God is hoy and God is love…. [A] false spirit of accommodation is sweeping the world as well as the church, including those who claim the label of evangelical. As Dave Hunt notes, all these powers given to Mary by Roman Catholic doctrine and dogma indeed makes a god out of Mary. The Mary of the RCC is a myth and an idol, who has nothing in common with the Mary of the Bible.